﻿ ASSA ABLOY Group | Why invest? ASSA ABLOY's investment story is built on more than 20 years of succesful growth, which has turned ASSA ABLOY into a global leader in door opening solutions. Future shareholder value is built on organic and acquired growth and a continuing process of rationalization and synergies across the Group. ASSA ABLOY is the global leader in access solutions, and offers a more complete range than any other company in the market. In, for example, the rapidly growing electromechanical security sector, which stands for more than half of sales, the Group has a leading position in fields such as access control, identification technology, automatic doors and hotel security. ASSA ABLOY is the strongest global player in the industry. The ASSA ABLOY brand is represented in all major regions, in both mature and emerging markets worldwide, with leading positions in much of Europe and North America, Asia and the Pacific. ASSA ABLOY owns operations in more than 70 countries, and through authorized distribution channels the Group covers the world. Since the Group was founded in 1994, ASSA ABLOY has grown from a regional company to an international Group with about 48,500 employees. The new "electronic world", which has brought an increased demand for electromechanical and digital products. Clients also express their need for extended access control and high security in their identification process. Entrance automation is another field that is growing rapidly in the electronic world, providing increased convenience. Geographically ASSA ABLOY will also continue to build the Group's presence in emerging markets where urbanization is a strong trend and the need for security solutions is expected to grow as the standard of living continues to improve. To keep a 5 percent organic growth, ASSA ABLOY also wants to utilize the ASSA ABLOY brand asset on a global basis by, over time, transforming local brands into the ASSA ABLOY brand, which has been chosen as the Group's master brand. A selected number of global brands will also be used and on a local basis product brands will continue to exist with a strengthened ASSA ABLOY endorsement. ASSA ABLOY’s customer base is generating stable sales and profit, and is driving organic growth. 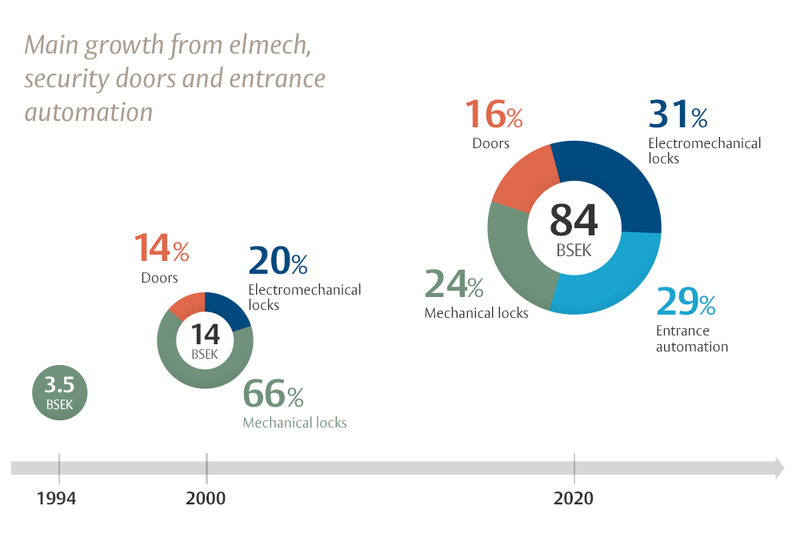 Due to its unique global market penetration and the world’s largest installed base of access solutions, two-thirds of ASSA ABLOY’s sales are to the aftermarket. The aftermarket consists of renovations, refurbishments, extensions, replacements and upgrades. 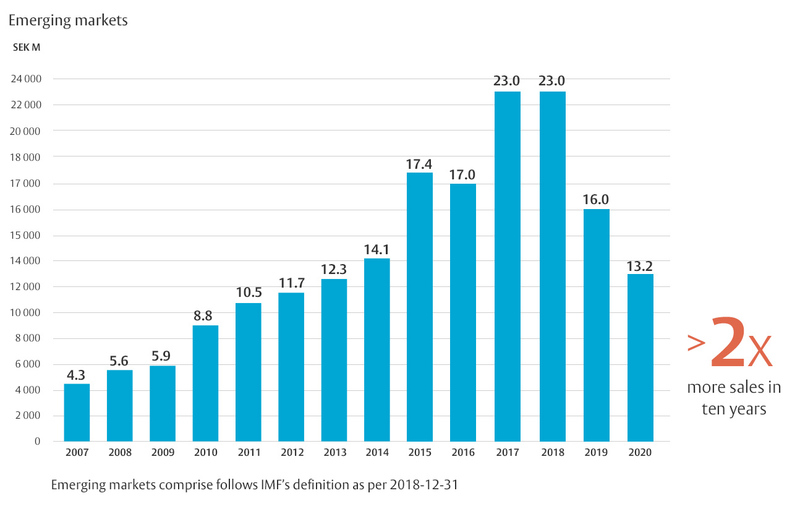 Demand in aftermarket is more stable than in new construction, which means that ASSA ABLOY’s sales and profitability are less sensitive to cyclical fluctuations. Three quarters of the Groups sales is towards commercial and institutional customers with a higher demand for electronic products and complex solutions, and therefore higher profitability. ASSA ABLOY is exploiting the strength of the brand portfolio and the sales force to drive further organic growth. ASSA ABLOY has grown as a result of its many acquisitions and today the brand portfolio consists of leading brands. In order to exploit this valuable brand asset while benefiting from the Group's size, ASSA ABLOY's logotype is combined with the individual product brands. The latter are well known and rooted in local regulations and security standards. The Group thus capitalizes on its large global installed base, while increasing the visibility of the ASSA ABLOY master brand, which unites the Group's sales departments and represents competence in access solutions. 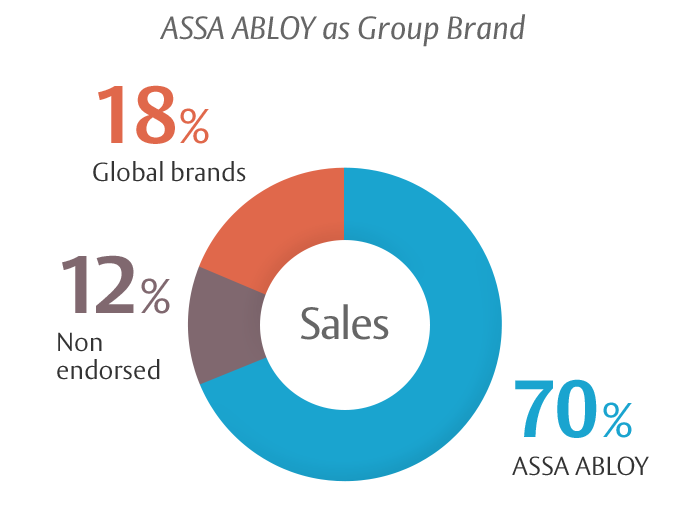 The ASSA ABLOY brands account for around 70 percent of Group sales. 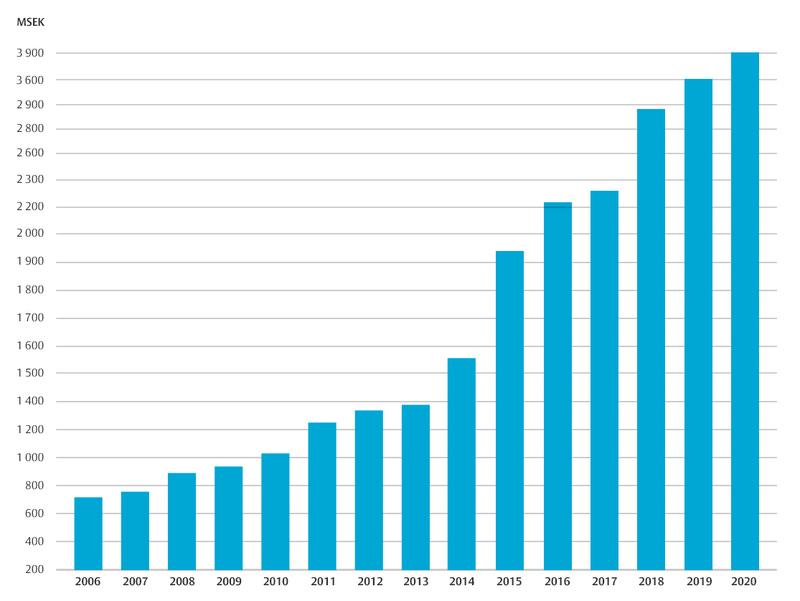 Looking at the growth story over a longer period of time, ASSA ABLOY has seen amazing growth since its start in 1994. 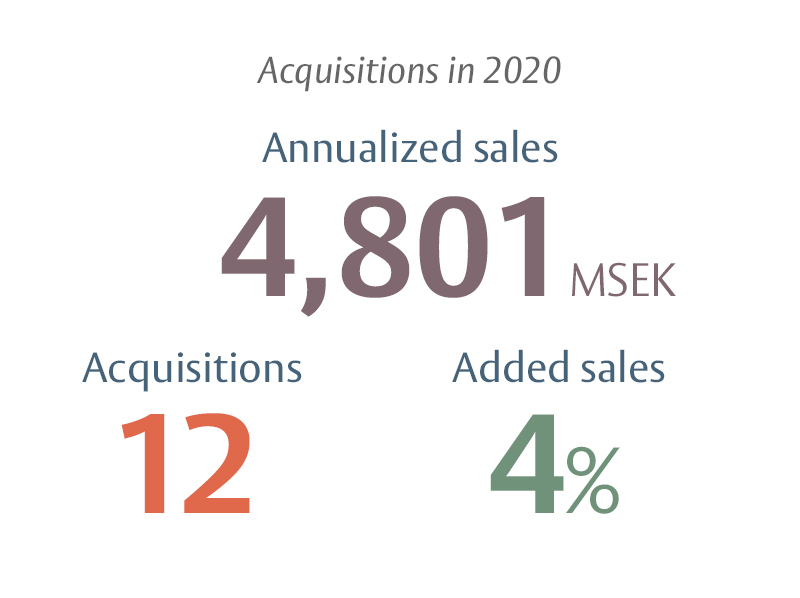 In 20 years ASSA ABLOY has acquired more than 200 companies. A key element of this rapid expansion has been identifying and building relationships with companies that can contribute to ASSA ABLOY's goals, then successfully acquiring and integrating them into the Group. ASSA ABLOY plans to continue this strategy to ensure the company captures the opportunities presented by new technology and a market that is always growing in response to security challenges. This approach means that not only is ASSA ABLOY ahead of its competitors in terms of identifying new customer needs, but the Group also has the resources to develop new solutions, establish standards and educate the market to meet those needs. ASSA ABLOY takes pride in the way the company incorporates new acquisitions into the Group. It's about achieving a balance between the scale and reach of global firm and retaining the strength of local experience, skill and knowledge. In this way our new companies provide added value to all our customers by contributing to complete solutions that bring safety, security and convenience. Successful product development is vital for the Group's competitiveness and future, and as innovation also supports the Group's target of 5 percent organic growth. The innovation strategy aims to create cost and functional benefits for the customer, through constant small steps. All new projects are driven by current and future customer needs. The Group-wide innovation process is based on ASSA ABLOY's global presence and strengthens local operations. The strategy has three objectives: new products should account for at least 25 percent of sales, new products should contribute to higher margins, and innovation efficiency should be doubled through a combination of more efficient processes and higher product value. The focus on product leadership has been very consistent. 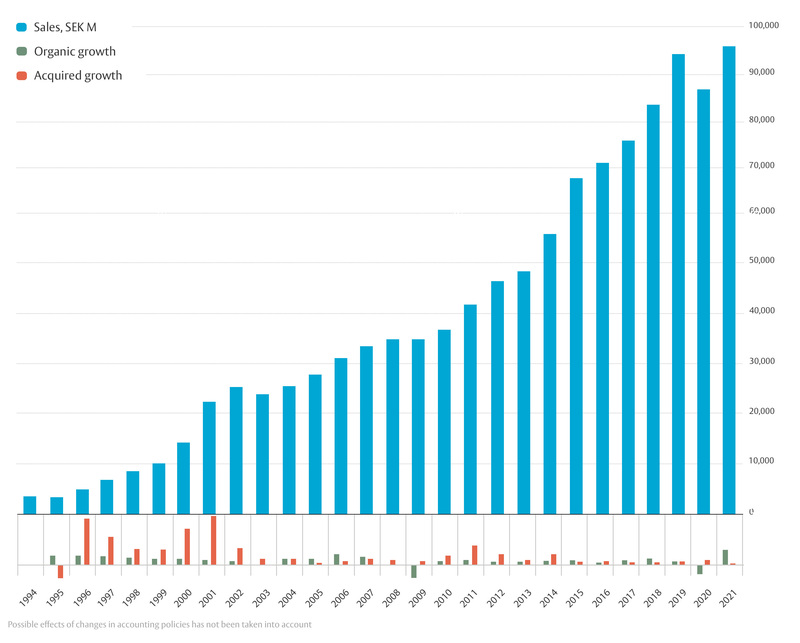 The number of product development engineers has increased by more than 70 percent to nearly 1,400 in eight years, many with an electronics focus. Sales of products launched in the past three years have increased to more than 30 percent, exceeding the Group's target of 25 percent. This is a well-considered level in view of the 10 to 15-year product life cycle. In 2018 the U.S. business magazine Forbes, for the fourth time, ranked ASSA ABLOY, as one of the world's 100 most innovative companies. The ASSA ABLOY financial target of an operating margin of 16-17 per cent can also be measured by looking at earnings per share, which has increased successfully for many years. During the past five years sales have increased by 25 percent, operating income with 20 percent and earnings per share with 36 percent. Want to read more about the ASSA ABLOY Group?